Signed and dated l.r. corner, brown oil "SYDNEY LONG 1937". S.A. Parker Framing Works , 'Works in the collection with known Parker frames', pg. 27-68, Sydney, 2004, 50 (illus.). 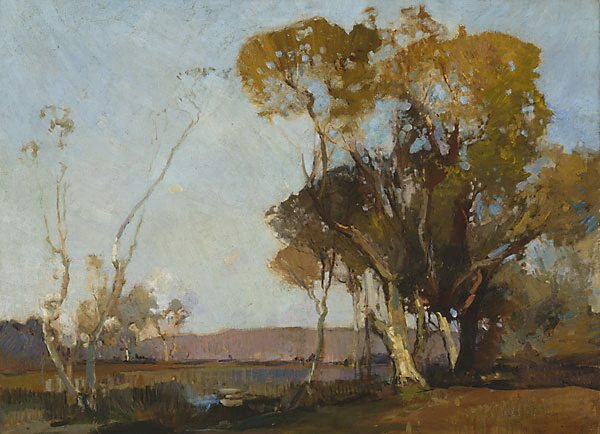 Ursula Prunster, Australian art: in the Art Gallery of New South Wales , 'Home and abroad', pg. 73-74, Sydney, 2000, 84 (colour illus. ), 301. Australian arcady: Landscape paintings from the Art Gallery of New South Wales collection , Sydney, 1983, (colour illus.). cat.no. 28 Note no pagination.